Guard W.R. Brannon was shot and killed during an escape attempt at the Noma Road Prison. 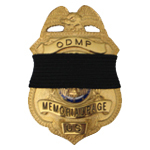 Rest in Peace, Correctional Officer Brannon. Your sacrifice is not forgotten.